I will be moving soon so I figured I’d search for some good tips to make the transition a bit more smooth than the last times. *I keep my clothes in the drawers just simply take the drawers out of the dresser. Clothes hung in closets generally stay on hangers and I just group them together and put a big garbage bag over them with the hangers poking thru like they do in dept stores. Otherwise trash bags for other clothing. *Don’t pack boxes so heavy that you can’t lift it. especially as a woman, in the event your male helpers fall thru, you will need to be able to do it yourself. I find boxes with build in cut outs for handles the best. I take them from my job, the ones that hold the printer paper. They’re smaller but they are made great and very durable with handles AND lids. *Fill the bigger boxes with lighter fluffier things like bedding, towels, linen, toss pillows. Put heavy items at bottom of boxes with lighter on top. Don’t be afraid to drive around the backs of strip mallsto gt free ones. I know…..nasty, but when I moved out my parents house back when I was 22, my dad did just that and scooped up brand new, nice boxes at the tops or sides of dumpsters. I was so embarrassed but it was free and saved me money than if I bought packages of boxes from postal stores. Also use boxes from your jobs. Ask the mailroom people if you can borrow any bubble wrap. Instead of buying bubble wrap, consider wrapping kitchen glassware in linen or kitchen towels in addition to packing paper. *Use storage bins. They’re great because they easily store inside one another and they have lids. You can save on boxes for future moves because you will already have storage bins. I have quite a few. The longer lower ones that I have under my bed are going to be used to transport magazines and paperwork. The bigger ones will go for dishes, pots and pans. speaking of, they say pack dishes on side. *Use quilted furniture pads to wrap tvs. As a matter of fact, try keeping the original boxes small appliances and electronics come in that way you won’t have to seek specialty packaging. *Fill air in the box with smaller items to fill any unusued space. Use vacuum bags for pillows, towels, blankets to save space. Any little nook and cranny shouldnhave something in it. 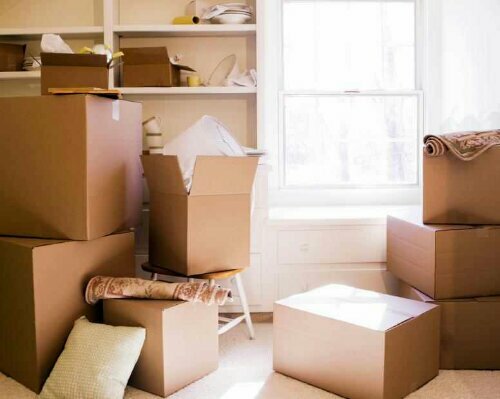 Eventually you will save in the amount of boxes you use which can save money and time as there’ll be less to move. Also put socks in shoes and keep clothes in drawers. (Simply remove the drawers). *When using newspaper, be careful as the print can stain items. It should really be used around packing paper. *they say pack dishes on the sides. *Label boxes but unless you and trusted people are helping you move, be mindful of what you label. No need to broadcast that your grandmother’s precious diamond bracelet is in that box. Try sticking with labeling by room. And maybe even more specific saying “kitchen cabinets upper” or “bathroom sink” or “bedroom armoire”. Only you will know that important docs goes in that armoire. If that’s still not specific enough, use colorful duct tape that even Dollar Stores are now selling. Use them and have a list that stays with you so you know what the color stands for. EX: pink for hygiene/toiletries. Use duct tape for label purposes only but stick with packing brown tape to seal boxes. *If you can, try to avoid grocery shopping the last week or two before moving so there’s less food to worry about. *Consider renting dollies. Fortunately for me my brother has some. He also has those things you place under furniture to roll into position. * When you load the truck, make sure the items you need right away when you go in (cleaning supplies, refrigerated/frozen food) is loaded last that way you can remove those first and not have to wait the length of time it takes to unload a truck before getting to it. *Also have bedding packed on the truck last so after you’ve moved, if you need to recharge, you will already have the bedding located. If you can, make the bed as soon as it’s set up so you don’t have to do all of that after you’re tired from a long day. *In additional to cleaning supplies being last to load, also have a box for paper plates, napkins, snacks, toilet paper, paper towels, hand soap etc so that you can immediately place those where they belong. When people want to get snacks or beverages, the plates and cups will already be there and people can use the bathroom without screaming for someone to grab tissue. *Lastly have snacks and beverages on deck for movers and helpers. And if it’s in thr budget, buy pizza or a lunch for everyone. No one likes to move especially whrn its the dead of winter in Milwaukee (what am I thinking? Lol) but you want the experience to be as pleasurable as possible. Real simple has a great checklist counting down from 2 months to move. Check it out here. Helpful estimations on how many boxes you’ll use or packing tape you’ll need can be found here. Here are packing food tips. If you have any, I’ll love to hear. Previous Post Remember when…I blogged about this marble backdrop behind this chrome tub? Great tips lady! No clue how you found the time to put this all together while preparing to move! For clothes on a hanger, I strongly suggest those hanging boxes you find at Home Depot. Keep things wrinkle free an ready to hang right away once ya move. Good luck! You have given very useful tips for packing and these tips are very helpful when we moving and your article is one of the most informative and clear on this subject I’ve read above. Your use of persuasive content and compelling information makes this article pop off the page. I like your style. Packing is a difficult and back-breaking task that everyone doesn’t want to do. Thanks for sharing packing tips that would help a lot whenever move to longer distance.